When you add Whizbang to your deck, it replaces your hero, your deck, and renames it to "Whizbang is Wonderful". Each game you play, one random currently available deck recipe is chosen as your deck. There are 18 choices, 2 for each class. Join the discussion on our forums! Come discuss Whizbang the Wonderful over in our dedicated Whizbang the Wonderful discussion topic. As of today The Esteemed Mr. Whizbang (of the Westfall Whizbangs!) uses RoS deck recipes. I played through multiple games until I got both decks for every class to confirm that they were all full RoS recipes. are these decks strong or they are just for fun? I got a golden Whizbang when unpacking during boomsday and it gives 18 gold decks which is both fun and looks very cool. It is fun to use many different decks because for me even using a great deck to climb the ladder just gets boring after a while because i get bored of playing the same stuff over and over again. Confirmed: Whizbang now delivers Rastakhan deck recipes! Strategy guide has been updated to discuss each deck. Contributions welcome. 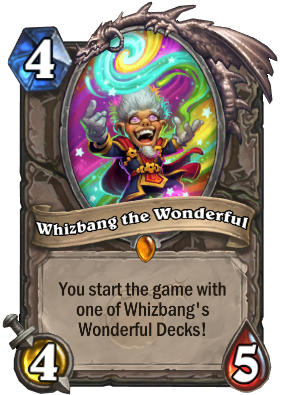 In what is likely my final Boomsday pack ever (outside of the occasional giveaway), the very final card was Whizbang - and I couldn't be more excited to draw him going into a new expansion. This means that right off the bat I'll be able to play around (randomly, of course) with the new cards and various deck recipes which is freaking awesome. This card really does deserve a spot in the Classic set someday. That's awesome, congrats! I crafted golden whizbang on day 1 of Boomsday, for exactly those reasons. Decks offered in that way, aren't op, but i got to try many cards i wouldnt be able to try another way, since im a free to play player. That's the only golden card i ever crafted. I'm not 100% sure how this helps new players all that much. You don't get any real consistency from it unless you play tons and tons of games, so instead of building one deck and learning it well you just play a different deck poorly over and over. For skilled players on F2P accounts or just looking to have a little fun/variety this card is great. As a learning tool its horrible. Very flawed logic, but ok.
Not likley, but you can climb to rank 15, depending of the opponents you get, and the deck that you get. Some of the decks are really great, maybe even tier 2, but some just dont have any real win condition, and have some unreasonable cards included. Wish it was free. I haven't been keeping up with hearthstone as much as I used to so I've been lacking a lot of key legendaries from the last couple sets, but if I craft this (probably golden) it basically assures that I won't have the dust in the future. Love the idea, the decks seems fairly competitive too. If Blizzard would have just given this to everyone or at least made it cheaper to craft or something it would be perfect.